Biosensors Market size is set to exceed USD 29 billion by 2024; according to a new research report by Global Market Insights. Technological upgradations in the biosensing devices has positively influenced adoption rate of biosensors that are being used in medical field. Increasing applications in diagnosis of various diseases will stimulate growth of biosensors industry significantly. The newly developed biosensors are applicable in detection of blood sugar levels, pulse rate and body temperature that show highest accuracy. The industry growth is also driven by increasing prevalence of chronic diseases in the geriatric population, increasing preference for point of care testing provided by the biosensors. High preference for portable miniature biosensor devices will escalate the industry growth. These portable biosensor devices are highly preferred by the geriatric population which is susceptible to suffer from chronic diseases and require continuous critical monitoring. Moreover, rising prevalence of diabetes due to sedentary lifestyle in urban and metropolitan areas have increased the demand for portable biosensors that help in sustaining the health of individuals. However, high costs associated with the biosensors may restrict the industry growth. Wearable biosensors accounted for over 55% of the industry revenue in 2017 due to growing prevalence of chronic diseases such as diabetes and other hormonal diseases that are related to obesity. Increasing awareness in the adult population for maintaining health have increased the adoption rates of wearable biosensors that has stimulated the overall biosensors market growth. Thermal biosensors market size was more than USD 1.4 billion in 2017 and expected to witness steady growth owing to their high accuracy and efficiency. Thermal biosensors have many clinical applications that enhance the demand and stimulate the business growth. Increasing use of thermal biosensors in drug discovery process will boost the segment growth significantly. Blood glucose testing segment accounted for over 70% of the industry share and anticipated to witness more than 8% growth till 2024. Increasing prevalence of diabetes will drive the segment growth. According to WHO, around 422 million in the world suffer from diabetes. Increasing incidences of the disease has increased the demand for portable glucose testing biosensors. Major key players are trying to implement technological innovations in these glucometers to help in improving patient’s health by maintaining optimal blood glucose levels. The use of biosensors in laboratories will increase due to rising prevalence of chronic diseases that requires accurate diagnosis; thus, growing demand for biosensors in such research laboratories will accelerate the segment growth considerably over the forecast timeframe. Nearly 45% of Americans suffer at least from one chronic diseases that enhances the business growth. U.S. biosensors market will witness over 6.5% growth owing to increasing geriatric population suffering from chronic disorders such as diabetes and hypertension. Also, high preference for portable biosensors that provide easy and quick detection to patients suffering from such chronic diseases will influence industry growth. Germany biosensors market was valued over USD 1.3 billion in 2017 and is anticipated to witness significant growth over the coming years due to continuous integration of advanced technology in the biosensors devices. Moreover, growing preference for biosensors that are utilized in point of care services, especially in the hospitals for rapid detection have escalated biosensors industry growth. 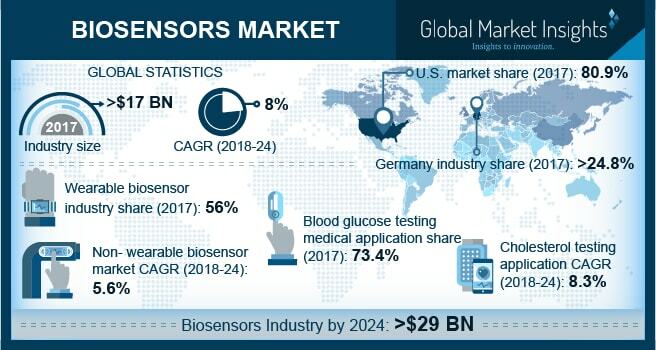 Some of the key industry players operating biosensors market are Abbott Laboratories, Bio-Rad International, Biosensors International, DuPont Biosensors Materials, Ercon, Gwent Group, Innovative Biosensors, Johnson & Johnson, Molecular Devices Corp, Pinnacle Technology, QTL Biosystems, Roche Diagnostics, SDIX, LLC, Siemens Healthcare, TE Connectivity Corporation, Thermo-Fisher Scientific. Major industry players have been undertaking strategic decisions such as collaborations and acquisitions that have enabled them to maintain their brand value. In January 2018, Abbott laboratories developed new hematology testing system that enables examining blood on various parameters. Such new product development strategies enhance company’s product portfolio thereby generating revenue for the company.